What underlies the many problems of the modern world--from accelerating rates of extinction and desertification to the increased alienation of the individual--is a reality overload, an increasingly invasive mechanization and homogenization of modern life that glorifies consumption and conformity. This overload has been created from the constant force-feeding of too much information, a phenomenon that dispossesses us of our deepest connections to time, our physical world, and each other. Annie Le Brun explains that the degradation of the environment mirrors the devastation going on in our minds revealing a link between genetically modified foods and the transformation and decay of our language and communication. There is a direct relationship between the rupture of the great biological balances that govern the planet and the equally devastating rupture in our imaginal realm. The imaginal realm is the home of our dreams and the perceptions that feed our thoughts, individuality, and creativity. Without its influence we are forced to live a drab, alienated lifestyle based on consumption alone. If, as Shakespeare claims, “we are such stuff as dreams are made on,” this theft of our imagination by the reality overload threatens the very foundations of our existence. The worldwide success of Disneyland shows that this takeover by force is well on the way to succeeding. For it is not only our personal relationship to time and space being manipulated here. It is our age-old power to deny either one in the name of the marvelous that finds itself literally petrified. Reducing the world of fairy tales to the most banal three-dimensional reality is a tragedy comparable to the devastation of the huge forests. For this reason, it is not enough to bemoan this paving over of the marvelous without taking stock of the consequences. If the world’s oxygen supply is dependent upon the size of its forests, and if the devastation of the mental forest is equivalent to the devastation of the actual forests, what dream will still give us sustenance when we find ourselves invited to witness their systematic destruction? All the more so when we can reckon less and less with historical monuments, while the addition of elements possessing only a vague relationship to the whole eventually destroys the sensorial whole they continue to form, even in a ruined state. This is the point when concrete dematerialization, paradoxically reiterated with the construction of these hybrids, rises up as a bulwark against the imagination. In fact, by being neither false nor authentic, these revised and corrected historic monuments are given complete license to impose themselves by the substitutive mass of what they are not, until they totally obstruct the imaginary perspective. All the more so because, lacking reference to any tangible event, their solid presence rarely fails to provoke a new kind of bewilderment. A bewilderment that is inevitably reminiscent of what is engendered by the “nonplaces” of excessive modernism: airports, parking lots, commercial complexes, and the like, although it is from their reality overload, empty of any meaning exceeding their casual roles, that these constructions draw their power to confound. For here we have monuments whose characteristic is to deny the implicit reference of every spatial construction to the human body, long “conceived as a portion of space with its frontiers, vital centers, defenses and weaknesses, strong points, and defects.”1 Here we have monuments only reflecting a single functionality, by definition concealing the physical and psychic integrity of their users. Despite appearances, the same is true for so-called historic monuments where, one substitution upon another, the temporal dimension as a concretion of individual and collective life is conjured away, and where the concrete dematerialization of what had created profound meaning ends up producing places reduced to the status of empty décors. Should it be so astonishing, then, that the emergence of the discourse on the famous “places of memory” that allegedly speak “to our contemporaries about who they are by showing them who they are no longer,” as Pierre Nora put it, has coincided with the multiplication of these “nonplaces” with historical pretensions, which, by manhandling the awareness of times past as well as that of current events, deceives us as much about who we no longer are as about who we are not yet? Every individual’s sensorial landscape is struck by this kind of degradation, which is equivalent to the destruction afflicting our forests, rivers, and shores. But what else could we expect of a time whose aesthetic plan is commingled with a pleonasm doomed to reproduce itself until it no longer resembles itself ? This is especially true when the resulting proliferation of hybrids illustrates the sole mode of representation of a time that, incapable of rejecting it, is condemned to an infinite “restoration-reproduction- recreation” of its bodies and ideas. Absolutely, no question, certainly, and without a doubt. For this reason it is high time we realized that there is nothing separating the reality overload from the virtual, as we might think. Novalis can help us here with his observation: “One usually understands the artistic better than the natural. There is more spirit in the simple than in the complicated, but less talent.”2 This statement may well be of a nature to explain the stupefying facility with which, in hardly ten years, the virtual has gradually taken the place of the imaginary. Or at least how, in such a short while, we have been convinced that the modernity of the former can advantageously replace an imagination grown obsolete. To wit, that the virtual is not at all the negation of reality as everything prompts us to believe, but corresponds rather to the victory of the reality overload, one that endlessly overflows the real to achieve victory by objectifying the space of what does not exist on a daily basis. In other words, parallel to the current promotion of a culture that is leading to the liquidation of culture, the emergence of the virtual is slowly but surely leading us to the liquidation of the imaginary. A strange kind of violence has been set to work to reach this point. Comparable in its results to the brutality employed, one substitution after another, by concrete dematerialization, which is affecting all appearances today, the characteristic feature of this violence is to never show itself in broad daylight. It achieves its goals in the depths of our sensibility, taking over the obscure theater where, just a short time past, perception and representation confronted each other. Annie Le Brun, a member of the French Surrealist group during its later years, is a poet and essayist who has written books on subjects as varied as the work of Raymond Roussell and the war in the former Yugoslavia. Her groundbreaking work on the Marquis de Sade has been translated into English as Sade: A Sudden Abyss. She lives in Paris. "This is an astonishing book, one of the best crafted books I've read. . . . an intellectual tour de force, raising provocative issues and warrants an in-depth review." " . . . challenging, yet resonant and rewarding work for ones familiar with the prevailing understandings of postmodernism." "The author links many modern ills to this information overload fact, discussing relationships between ecology, human actions, and the abandonment of the magical realm and dreams . . . a pick for both new age and philosophy collections." 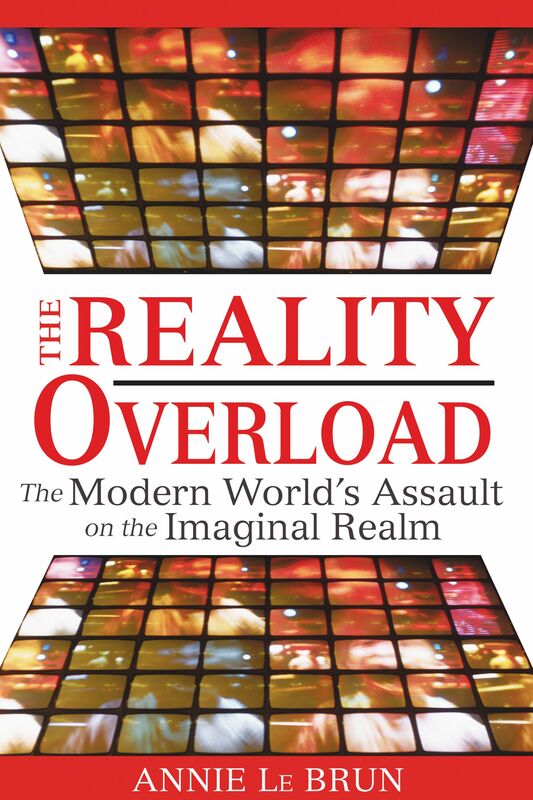 "The Reality Overload is an intriguing treatise on modern society, highly recommended." "But it is as a poet that Annie Le Brun offers us perhaps what we lack most of all: a sensibility grown transparent through an understanding of negation as by an exaltation of the imagination; the imagination of the body. And it is this sensibility that she brings to The Reality Overload." "An excellent book that makes a much-needed connection. Imagine a world in which we "green" the realm of meaning and fantasy in addition to just the material world!"